Three different projects dealing with presence, absence and the passage of time. The first one is straight photography: no tricks. 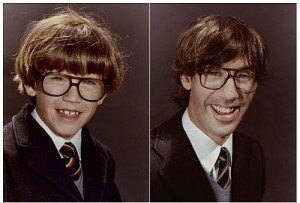 Irina Werning’s Back to the Future features adults posing as their childhood selves in replicas of old pictures that they sent in ahead of time. At first glance, another exercise in the knowing, ironic nostalgia that is one of the aesthetic markers of our age. There is craft and playfulness in the photographs in the series. In one of the image pairs, a little girl wearing comically oversized boots is replaced by a young woman who fits the boots just fine. These gags aside, however, the images are emotionally opaque: the mimicry of infantile expressions by the adult subjects negates the reaching of maturity. It’s often the case, in the retronaut genre, that time is compressed into a saturating, everlasting present. Everything is a now that can be digitised, even interior states of being. 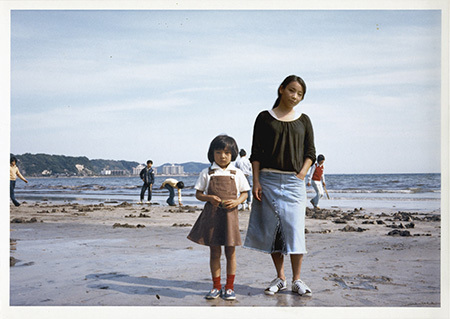 The second project, Imagine Finding Me by Chino Otsuka, is bolder. This time the childhood pictures are of Otsuka herself, who appears in them also as an adult. ‘I become a tourist in my own history,’ she explains, except one who appears to be invisible to the country into which she has travelled. Her younger self cannot see her. They stand together, but make no contact. It usually leaves me cold, save for this one instance. 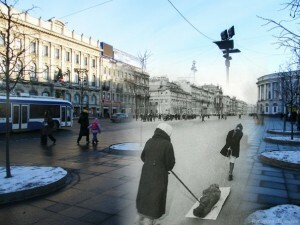 A set on Leningrad then and now, in which ‘then’ was during the blockade. One image above all: of two women – one young, one old – dragging a shrouded corpse on a blanket, out in the open, on the pavement (Leningrad then); while just metres away, pedestrians walk alongside a modern tram (Leningrad now). Then and now are cut off from each other, like in those pictures by Chino Otsuka, except to a much more dramatic effect: the indifference of the present for the past is intolerable (won’t anyone help those women?). However, there is another level at which we are forced to interpret the picture. That is, as the side by side representation of two quotidian experiences: one, of residents walking and using public transport, confident, unhurried; the other, of women dragging a lifeless body, possibly not their first, onto the pavement. Both are pictures of daily life, on the same piece of Earth, at but a few decades remove. It is the work of history to reconcile them. That wasn’t the third photographic project I had in mind, however, but rather a link into it. Gustavo Germano’s Ausencias (‘absences’) begins with a picture of four young brothers. Gustavo (the youngest), Guillermo, Diego and Eduardo. Then a second one, of the brothers as grown men, but with an empty space where Eduardo ought to be. He was kidnapped in 1976 by the military, aged 18, and now figures as a victim of the guerra sucia, Argentina’s dirty war. In another, Orlando René Mendez and Leticia Margarita Oliva are sitting in the sun on the shore at ‘La Tortuga Alegre’, Rio Uruguay. In the next picture, taken on the same location in 2006, Orlando and Leticia are gone. Like Irina Werning, Germano does not resort to photographic manipulation, yet his image galleries – unlike hers – are all about marking history and the passage of time, along with the loss of innocence and life. Germano has no interest in reproducing the exact perspective or style of the original images. He’ll often switch to colour when the ‘before’ picture was in black and white. What counts is those captions. In this place, at this time, who is there, and who is not. I’ve read this a few times. First I thought it quite Barthesian, and spent time looking for the punctum in the Leningrad image (which is very powerful), until I realised that Ausencias is far more powerful because, as you state, it deals more with political pain and loss due to an enforced absence, which is the same precondition for historical juxtapositions which exist beyond the artificial frame of any photograph, which are always there, and which exist in the interstices around us every day, but which mostly we are blind to as we go about our quotidian existences. Thanks, I’m a real sucker for this sort of historical stuff involving memory and loss.